The American Red Cross is facing an emergency blood shortage and has issued an urgent call for individuals all blood types to give now. After blood donations slowed during the Independence Day holiday week, blood donations are currently being distributed to hospitals faster than donations are coming in. More donations are needed now – especially type O – to replenish the blood supply. Make an appointment to give blood or platelets by downloading the free Blood Donor App, visiting org or calling 1-800-RED CROSS (1-800-733-2767). 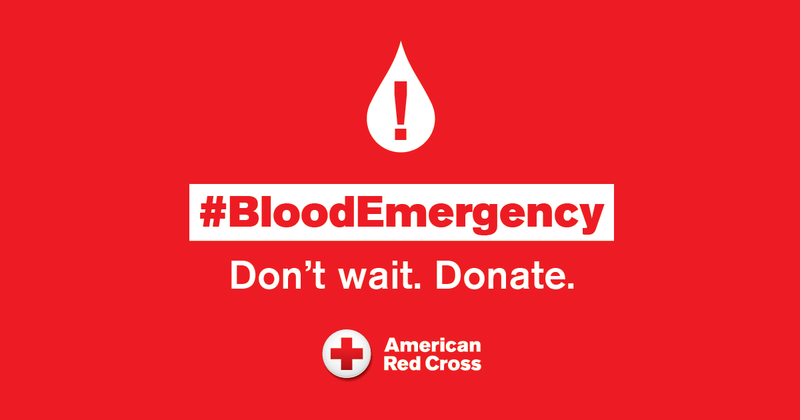 Let your friends and family know there is a #BloodEmergency. New and current donors of all blood types are needed to help ensure the Red Cross can meet the needs of patients every day and is prepared for emergencies that require significant volumes of donated blood. Now. Your support can help ensure that blood products are there for trauma victims, premature babies, patients going through cancer treatment and others who rely on the generosity of volunteer donors.